While you’re poking around at the antiques mall you notice a pair of gold-plated earrings sitting in a tray. You could snag them for less than $10.00, but why bother? They are going to contain only maybe 50 cents worth of gold at best. So you walk on by and keep looking for more interesting items. Where can you find platinum scrap, gold, and other precious metals in your local automotive scrapyard? Here’s a guide. So if there is enough gold on earth for each of us to own five golden rings, have you gotten yours yet? I am not joking, because if you devote some time and energy to acquiring gold, you can get to that five-ring, .76 troy ounce figure more quickly than you expect. Where can you find that gold? For starters, in places like these that you might be overlooking. . .
You will get a lot of results if you search for the phrase “Can a tablet replace my laptop?” on Google or Bing. The question has recently been tackled in The New York Times, in PC World, on CNET, and dozens of other places. If you read those articles, you will find that opinions vary. Some reviewers feel that the time is not yet right to discard laptops in favor of tablets. Others write about new laptop/tablet “convertible” hybrids from HP, Samsung, and other makers that are essentially tablets with keyboards that either detach or fold cleverly out of the way. Computers are always evolving, and similar questions have arisen in the past. Ten years ago, it was “Can a laptop really replace a desktop machine?” And we all know how that question got resolved. So who could believe that laptops are the pinnacle of computer development, never to be replaced by something newer? When new kinds of computers gain widespread acceptance, older machines get tossed and recycled in large numbers. Just peek at the place where electronics are recycled in your town or city – perhaps in your town dump. On a recent visit to my town’s, I noticed that not only desktops, but also laptops and other types of escrap were starting to pile up. And if you’ve been reading this blog, you already know that laptops contain valuable quantities of gold and other precious metals that can be worth reclaiming from their circuit boards, connectors, IC chips and other parts, using a top precious metals recycler. Because used laptops contain only a few dollars’ worth of gold and other precious metals, it takes a large number of them to add up to much – plus, there is the challenge of dismantling them to extract the parts that contain gold like circuit boards and contacts, pins and meltables. Yet the fact remains that a very large number of laptops are about to be discarded in the coming years. If you can start a program to collect them, the dollars could really add up. If you are one of the following organizations, this could be a good time to start collecting laptops for later recycling . . . If you are an electronics retailer, consider ramping up your trade-in program. If you are an electronics manufacturer or wholesaler, provide incentives for retailers to accept trade-ins and return them to you. If you are a church, charity or school, consider conducting a drive to collect laptops that are no longer needed. If you are a hospital or healthcare facility that is about to replace older laptops and equipment that embodies them, start your own in-house recycling program. As the old saying goes, “A penny saved is a penny earned.” Since each old laptop contains many pennies’ worth of gold, why toss them away? Call us at 800-426-2344 to learn more about profitably recycling computer scrap. Old computer central processing units (CPUs) look like porcupines – they’re covered with little spikes that serve as electrical contacts when the CPU is plugged into a computer’s motherboard. The difference between a porcupine and a CPU is that all those little “quills” are gold-plated and can be worth sending to a qualified gold refinery for processing. 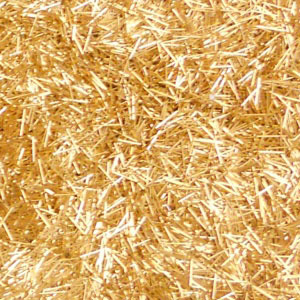 Photo of gold plated pins e-scrap sent to Specialty Metals by our customers for recycling and refining. The more CPUs you have, the more pins you have . . . and the more gold you have too. Here’s a video that shows a hobbyist using a heat gun to remove gold pins from CPUs. He’s using the same kind of heat gun that is used to strip paint – the kind you can buy at a hardware store. Note that we are not recommending that you use a heat gun to remove gold pins from CPUs – it is something that should only be done by qualified technicians in a controlled, well-ventilated, laboratory setting. We are sharing this video to demonstrate that quantities of recyclable gold really do reside in older CPUs – and that if you have a number of older desktop computers or computer scrap, you could have more gold than you might realize. How Much Gold Is in CPUs? It varies, because many different kinds of CPUs have been used over the last few decades. There are ceramic CPU chips and silicon CPUs. But we’re pleased to offer you a ball park estimate of how much gold could be recovered from older CPU chips. When you call us to 800-426-2344 to discuss your old CPUs, please do not expect us to promise to reclaim one ounce of gold from every 10 pounds of them that you send to us. We only provide that rough estimate above to convince you that it can be wasteful – and unprofitable – to discard older electronics, especially computers and the CPU boards that they contain. Why not call us to learn more?